​Sky Glow is a result of light fixtures that emit a portion of their light directly upward into the sky where light scatters, creating a diffuse glow above a city or town. This light can then interfere with sensitive astronomical instruments designed to capture light from distant stars, nebulae, and galaxies. 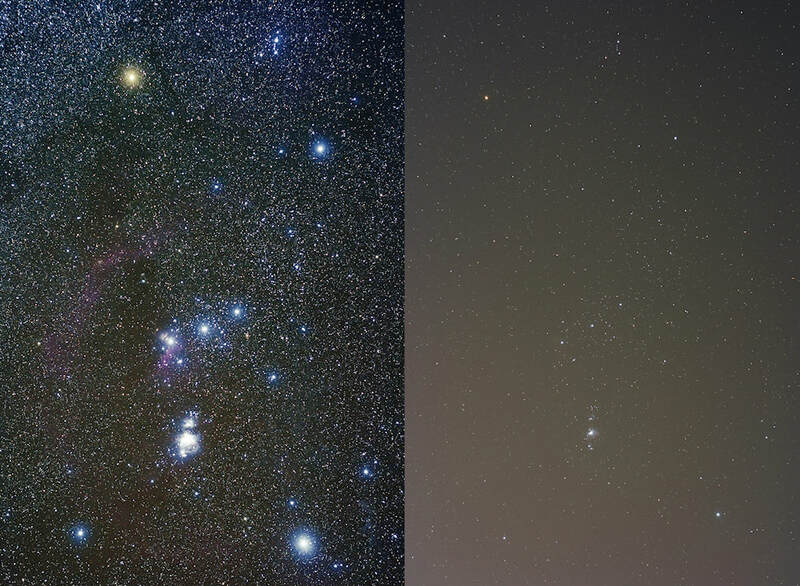 Sky glow can often be detected hundreds of miles away. The constellation Orion, imaged at left from dark skies, and at right from the metropolis of Orem, UT. 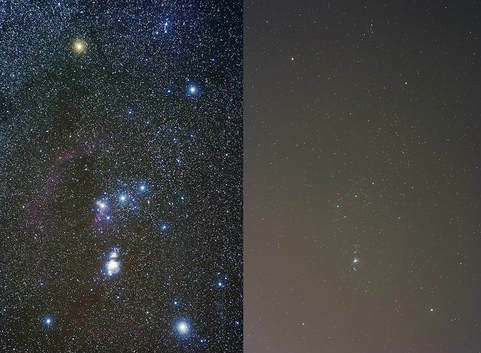 Photos taken 8 January 2009 by Jeremy Stanley, demonstrate that sky glow destroys the visibility of faint night sky objects and the beauty of the heavens. ​Light Trespass occurs when poorly shielded or poorly aimed fixtures cast light into unwanted areas, such as buildings, neighboring property, and homes. 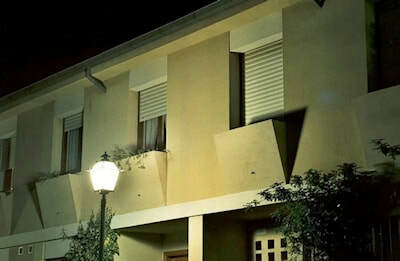 This nuisance outdoor lighting crosses property lines and detracts from property values and our quality of life - often affecting our ability to sleep and maintain good health. 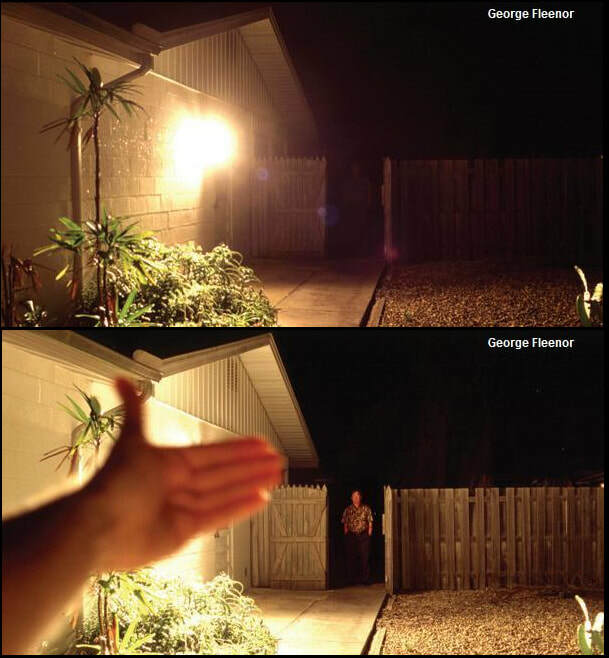 ​Light Clutter is a general term relating to lights put up everywhere, without regard to what their purpose really is. This is a result of poor lighting design. Overlighting is closely related, and results from the myth that “more is better.” It wastes a tremendous amount of energy every year. 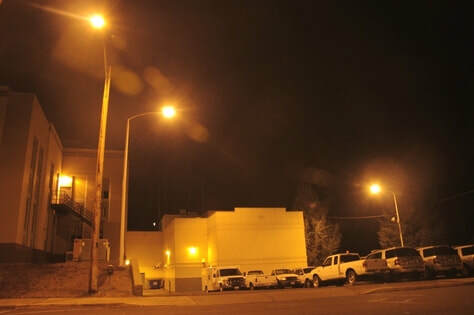 In the picture, excessive and "non-compliant" unshielded lighting can be seen at the Klickitat County Courthouse, resulting in light clutter and overlighting less than two miles from the Goldendale Observatory. Glare is light that shines horizontally, blinds, and causes harsh shadows. Like headlights shining in your eyes, glare makes things more difficult to see, and compromises security and safety. ​Example: Unshielded lights produce a dazzling glare, causing your pupils to constrict and admit less light, which compromises one's ability to see objects or people hidden in the shadows. Shielding removes this glare, allowing more light to enter the eye, thereby revealing details that were previously poorly seen, if at all. 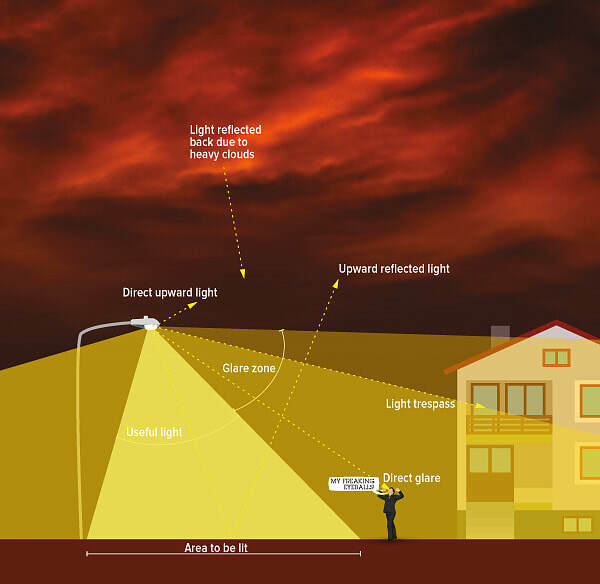 ​Another problem with night lighting is the issue of "color temperature." Many believe light at night should simulate daylight, which has a considerable amount of blue wavelengths. These are much more detrimental at night - blue light (5000 K) is scattered three times as much as amber light (3000 K), and disturbs our biological clock. Moreover, there is no need for this "daylight" at night, because our brains automatically adjust our perception of color no matter the color temperature of the light source. Using "soft white" or "warm" light bulbs and LED fixtures therefore is better for both you and the nighttime environment. ​The picture shows a daylight color temperature on the upper left, and warm soft white light on the lower left. 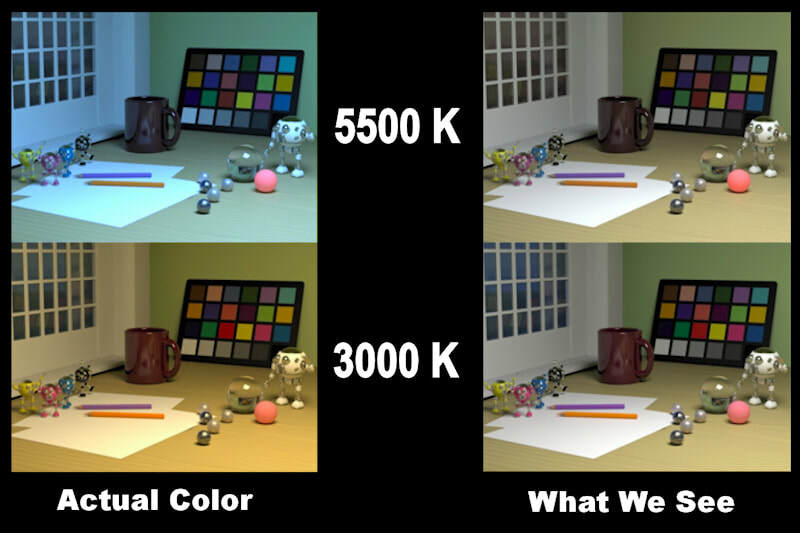 Thanks to the brain's ability known as "chromatic adaptation," we perceive both as about the same in rendering white as being "white", as seen on the right.